Something resembling Winter has once again returned to the Teton Range, and so have I. Just back from a few weeks of monkeying around in the desert, today was my first ski experience of the 2015/16 season. On day one my knowledge of the snowpack is very limited. You probably know more about the snow than I do right now, but these snow reports have to start somewhere, and acknowledging my own ignorance is Step Uno on the path to knowing the snow… or anything for the matter. As always, these snow reports focus on snow *quality*. These snow reports do NOT focus on snow *safety*. For current avalanche conditions and snow safety info check with Bridger-Teton Avalanche Forecast Center. 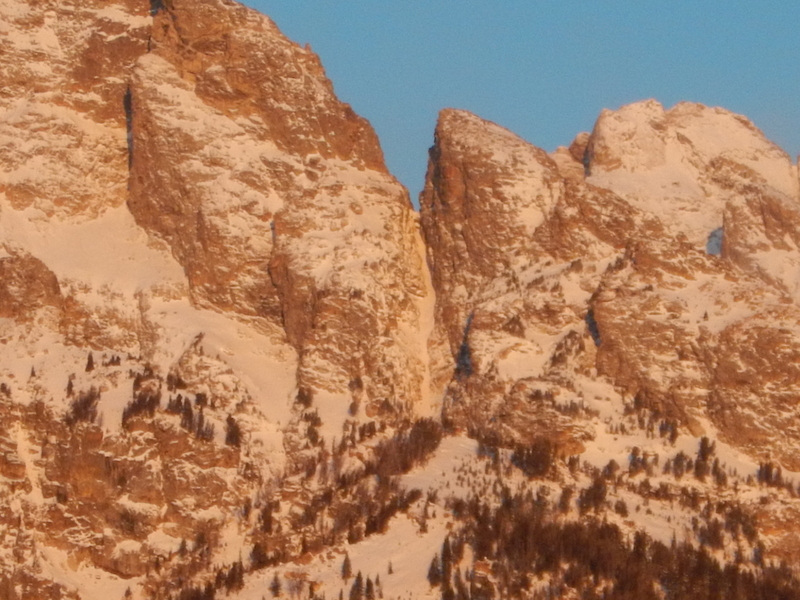 Today I checked out the snow in GTNP, on Teton Pass, and at Grand Targhee. I went with über-stoked Steve Matz, who has already logged a half dozen days in the backcountry this season. 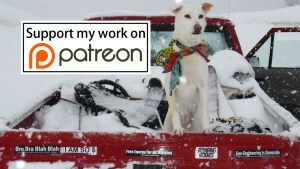 Our dogs — Bertha and Maestra — came along too, and enjoyed quite the dog party at Grand Targhee where dozens of backcountry skiers made the drive and hike/skin to score solid turns on a shallow but fun snowpack. 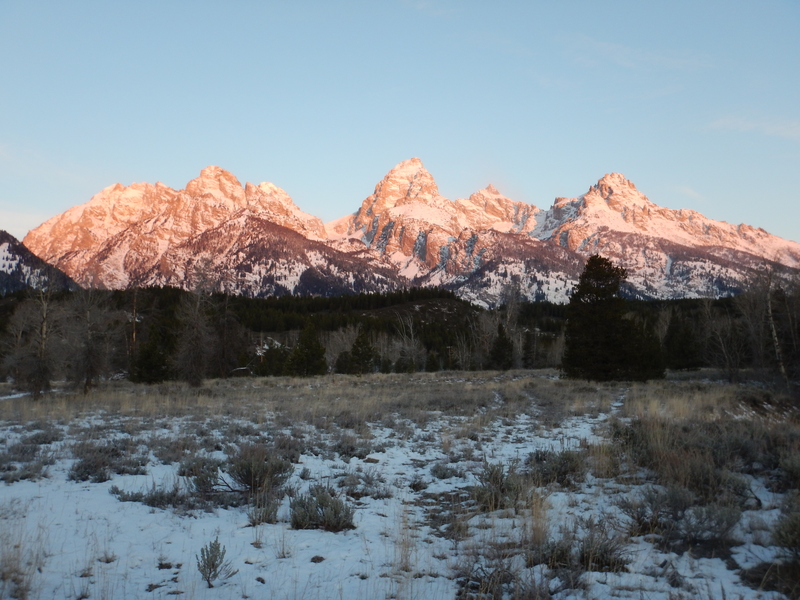 After being away for weeks I had to see what was going on up in the Grandest Tetons, so I drove up to Taggart Trailhead to enjoy an alpenglow sunrise and see what I could of the snowpack without leaving the parking lot. It is definitely NOT possible to ski to/from the trailhead but snowpack appears adequate — in some spots — for survival skiing above ~8000′. Around ~9000′ the snowpack looks substantial enough for cautious cruising. The upper mountains undoubtedly hold pockets of perfect powder on various aspects but getting there is definitely awkward at the moment. 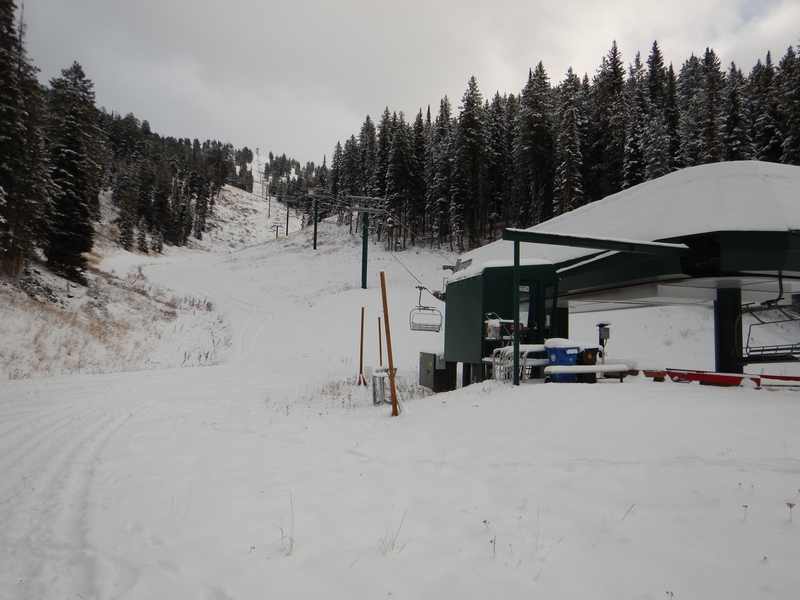 Taggart Trailhead snowpack on 11.11.2015: not top to bottom yet. The upper half of the Sliver on Nez Perce. Still looking pretty thin on 11.11.2015. The Park Loop road past Taggart Trailhead is closed to cars but still looks good for bicycle access to points North. It might be a fun weekend for a bundled up road ride to admire the snowy peaks with minimal crowds. I think I’ll let the lower flanks of GTNP fill in before monkeying my way into the truest Tetons. Further down the Range, Teton Pass looks HAMMERED on the South Side and Mt Glory looks pretty bony on most aspects. I haven’t skied the Pass yet, and have heard mixed reports regarding snowpack depth and quality. Coal Creek or the Claw could be interesting but both look rather rocky down low. There were only a half dozen cars at the top of the Pass when we rolled by at 11am, so maybe word has gotten out that it’s done for now. As such, we kept driving over to Grand Targhee where our crack of noon arrival revealed many cars in the lot. I couldn’t tell if the resort was already open or not. It’s not open, but the skiing is great. Friendly, helpful staff are all over the mountain prepping for the upcoming season. Hooray for Grand Targhee! Snow was good to great at upper elevations with manageable crusts on some aspects under 4-6″ of fresh that fell yesterday. It is definitely still shallow but the snowpack is adequately supportive for fat skis on the upper mountain. On the lower mountain Targhee has groomed quite a few cat tracks and is making snow, resulting in good top to bottom skiing from the summit of Fred’s Mountain back to the base lodge on the grassier and shallower slopes. Peaked Mountain has seen less skier traffic but offers less snow on its lower flanks. Upper Peaked is serving up great conditions but lower Peaked is quite rugged on most aspects. With fat skis it is survival skiable if you know where to go. It’s still pretty bony at Targhee but doable if you like risking your season for a few good turns. Pitches that have seen a lot of skier traffic already are not worth revisiting, IMO, and I think most of Targhee will get hit pretty hard tomorrow. I think I’ll hold off skiing over the weekend and hope for more snow forecast by early next week. Or maybe temptation will get the best of me and I’ll go exploring in the shallow snowpack again. We’ll see. Have fun and take it easy out there. One Love. Peace. Thanks dude! Been out walking but not sliding yet, going to bask in the sunshine this weekend, thanks for the updates.